Why would your dog have nutrient deficiencies? Since your dog lives with you, he is dependent on you to provide food. Even with the best of intentions dog nutrition is often lacking. What does your dog look like? Too fat, too thin or just right? Wild dogs would instinctively know what to eat and how to prevent a nutrient deficiency problem. Only if they couldn't get enough to eat, or if they were scrounging around in human garbage would malnutrition be an issue. Think street dogs from some impoverished country. which nutrients are under or over abundant in the diet. A nutrient deficiency is the absence or insufficiency of some nutritional factor required for normal growth and development. A nutrient deficiency disease is defined as an illness associated with an absence or insufficient supply of one or more essential dietary nutritional constituents. Body condition - look at the diagram above. Where does your dog fit in? Too fat, too thin or just right? Skin and coat - do you see a dull, dry coat, hair loss, skin problems, flaking skin, itching, redness, sores? Lack of energy - is your dog getting enough calories and nutrients for his activity level and stage of life? Behavioural problems - such as eating inappropriate objects, eating feces, anxiety, mood swings and unexplained aggression, being unable to learn, and hyperactivity. Something to think about, eh? Anyway, I don't want to get carried away with these examples. I just want to let you know what can happen if dogs are not fed a variety of fresh food in a way that is natural for their species. Why Would Your Dog Have Nutrient Deficiencies? Nutrient deficiencies in dogs rarely happen with dogs fed a commercial store bought dog food. No matter how poor the ingredient quality may be, there are still government regulated requirements ( AAFCO ) for macro and micro vitamins and minerals and some other essential nutrients that are met using a prepared vitamin premix that is added to the food after processing. Here are some other reasons why a dog may be nutrient deficient. Maybe your dog gets too much to eat. 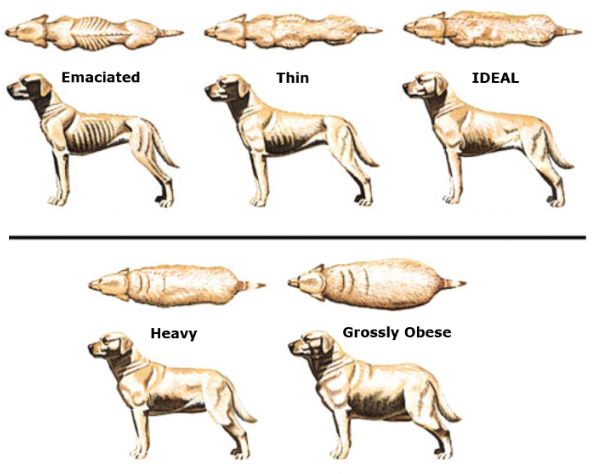 Fat dogs can be nutrient deficient too. Maybe your dog has parasites which are living off the nutrients your dog should be getting. Maybe you prepare home made dog food yourself. Heat from cooking destroys nutrients. This can easily cause a vitamin deficiency. Maybe you prepare home made raw dog food at home and don't completely understand the natural balance between meat bones and organs. Feeding too much muscle meat can cause mineral imbalances. What About Vitamin Mineral Supplementation? Deciding whether or not to supplement your dog's food is not easy. Over supplementation can destroy nutritional balance and even harm your dog. However, I believe that some supplementation is necessary, especially if you are cooking for your dog. Only Mother Nature provides perfect dog nutrition. If you have a sick dog, or if your dog has a chronic dog health problem, you might wonder if he has a vitamin deficiency? You might be correct, but how do you find out which vitamin or mineral is lacking? Don't bother trying to figure it out! Almost certainly, your dog can benefit from whole food supplements that can address the nutrient deficiency problem overall and help restore nutritional balance while speeding the healing process. Over supplementing is as dangerous as not doing anything though, so ask for help if you're not sure. Nutritional deficiencies are unnecessary and can be prevented when the diet is complete and varied. Feeding a variety of different foods goes a long way towards preventing nutrient deficiency problems. Over supplementing is as dangerous as not doing enough. As always, providing excellent dog nutrition through food is not rocket science. When in doubt ask yourself this question.
" Would Mother Nature give my dog this food? "